With the post of the Air Jordan 10 Retro “Infrared” today, it made us stop to admire the vibrant yet warm accent color. The color’s use in sneakers was made widely popular by the Nike Air Max 90, which grabbed the attention to any innocent bystanders by its hue. 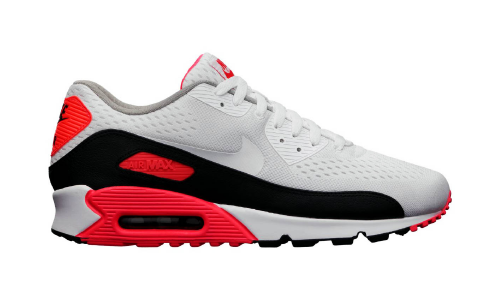 The intention of using “Infrared” was to denote function, technology and accented details on the shoe. The Air Jordan 6 Retro “Infrared” was also popular, as it was the sneaker that MJ wore when winning his first-ever NBA Championship. What color do you love on your kicks? Let us hear it in the comments below. Print article This entry was posted by hhcblog on January 22, 2014 at 9:06 pm, and is filed under Footwear. Follow any responses to this post through RSS 2.0. You can leave a response or trackback from your own site.